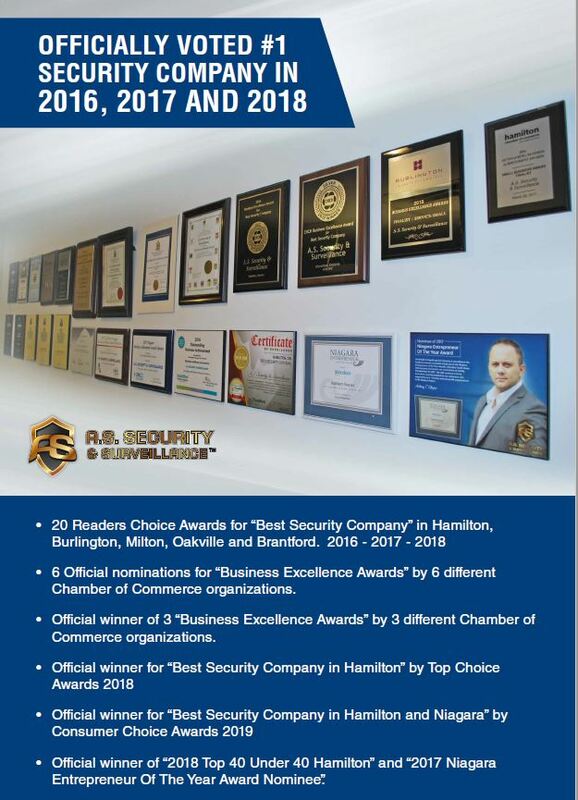 A.S. Security & Surveillance has been officially voted “Best Security Company” in Hamilton, Halton and Niagara Region by winning over 24 Regional and industry awards. We are a licenced, insured and WSIB certified company specializing in commercial and industrial security surveillance cameras and systems. As the premier provider of CCTV security surveillance systems for over 10 years, we pride ourselves on our reputation, detailed installations and long-standing partnerships with our clients. We offer the most reputable brand name products backed by a renowned all inclusive warranty and professional installation by our electronics technicians. We provide a wide range of CCTV surveillance products including over 1500 IP, HD and 4K cameras, HD DVR and NVR recorders, licence plate recognition and thermal imaging cameras, spy covert cameras and PTZs, explosion proof cameras and marine use cameras. With our office hours being Monday to Saturday 08:00 – 18:00 and along with our seven technical teams, we offer the quickest technical service including our 24 hour guaranteed response time. Trusted for our dependability and reliability, we have become Southern Ontario’s leading security and surveillance company accommodating the commercial, industrial, corporate and marine sector including condominiums, religious establishments, refinery and aerospace industries. With our security surveillance group of knowledgeable staff consisting of electronics technicians and technologists, electrical engineer, AutoCAD designer, Microsoft certified IT specialist, we can assure all clients that our staff will work in collaboration to help put into place a custom designed and brand name CCTV surveillance system. We proudly offer products by over 40 top brands in the industry including Axis, Vivotek, Bosch and Panasonic.